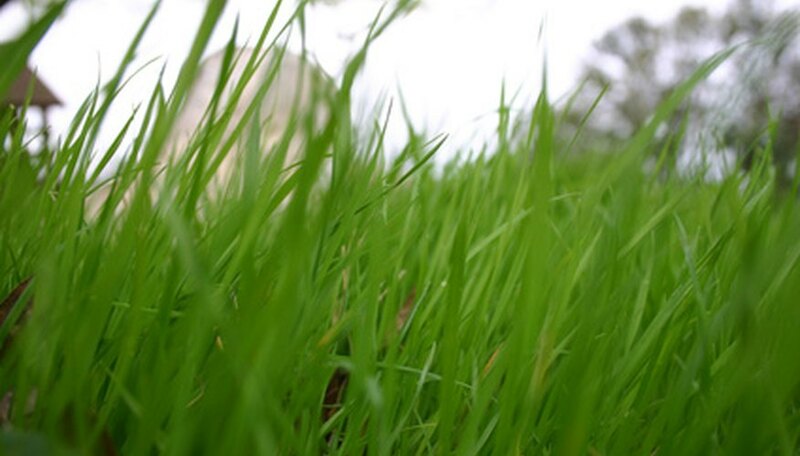 A sour smell in a lawn is most often be attributed to sour soil. Sour soil has far too much acid in it, making it difficult for grass to grow. Areas with sour soil will usually be covered in moss, which needs to be removed before you can apply the soil treatment. By amending the soil's acidity, you should be able to get rid of the sour smell and get your lawn back to health. Apply chemical moss killer to the moss according to the instructions on the packaging. The directions will vary depending on the active agent in the moss killer, so it is important to follow the directions exactly. Rake up the moss once it withers and turns black, a process that should take no more than a few days. Dispose of the dead moss. Dust the cleared area with a thin layer of dolomite lime. The amount of lime you'll need to re-balance the soil depends on the size of the area. Generally, you'll need 40 lbs. of dolomite lime for every 1,000 square feet of cleared lawn. Use a hand tiller to work the lime into the top layer of soil. This agent can take a long time to penetrate the dirt if it doesn't get a bit of help. Reapply the dolomite lime treatment twice more, once in the fall and once in the spring. Wait until after the final lime treatment to replant the grass in the cleared area.